Nearly 300 talmidim, parents, siblings, rebbeim, and faculty members joined us this past Motzei Shabbos for our Yeshiva-Wide Melave Malka, featuring Eitan Katz. We were excited to welcome parents and talmidim from the incoming Freshman Class of 2022, who also had the opportunity to learn more about our Yeshiva Fellowship program following the Melave Malka. The ruach was incredible throughout the evening as parents, talmidim, and rebbeim danced and sang together. 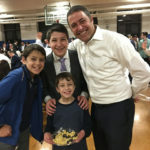 “I said it when I was here last year and I’ll say it again, Baruch Hashem I’ve been to many Jewish, Orthodox high schools across the country, and the MTA boys, they stand out as being just a little bit above everybody else. They stand out, with their middos and their kindness,” said Eitan Katz, who then went on to teach us a new niggun. Thanks to everyone who joined us! Click here to view photos and videos.